The males develop breeding tubercles on their heads similar to Goldfish. A social fish that does best in groups of its own kind. Can be kept with similar-sized peaceful sub-tropical fish. Will readily accept common aquarium flakes/pellets. They will also enjoy occasional feeding of live and frozen food. They are known to eat daphnia and other live foods in the wild. These minnows should be fed once or twice per day. They should only be fed the amount of food that they can consume in 2 minutes, or this will then go on to pollute the water. Will benefit from rockery/caves being placed in tank. Fairly tolerating of most water conditions. Social, active and hardy. Females will lay eggs under rocks (halved flowerpots work well) and once they are fertilized the male will guard them until they hatch. Top/middle feeder although will spend majority of time at the bottom of the tank. The wild type Fathead Minnow is olive-green in colour. A now-common red-pink colour morph gives this fish it's Rosy Red common name. 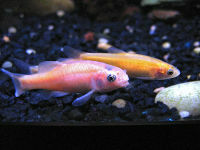 It is possible that the red-pink colour morph can be mistaken for a juvenile Goldfish to the untrained eye. It is in fact illegal to keep, sell or import this fish within England and Wales as per the Prohibition of Keeping or Release of live Fish (specified species) Order 1998, amended February 2003. ↑ EFishBusiness - CEFAS list of banned species. Controls in England and Wales on Non-Native Fish Species.